Tiana Sugui of Roosevelt took a shot against Vorell Telefoni-Sablan of Farrington last night. For now, the Roosevelt Rough Riders remain on top, but an asterisk for a TKO win might be fitting. The Rough Riders accidentally gave Farrington's top scorer, C'ani Kealoha, a welt on her right eye early in the second quarter. Kealoha struggled and the Governors never recovered as second-ranked Roosevelt pulled away for a 43-29 win last night at Richard Kitamura Memorial Fieldhouse. Point guard Dianna Zane had 13 points and dished out five assists to spark the Rough Rider offense. Tiana Sugui added 12 points, including a pair of big 3-pointers during a pivotal third-quarter run. Roosevelt improved to 8-0 in the Oahu Interscholastic Association Red East, taking one more step toward a potential first-place finish and an opening-round bye in the playoffs. Roosevelt's air-tight man-to-man defense limited Farrington to 12-for-36 shooting (33 percent), including 1-for-12 from beyond the 3-point arc. "Dianna shut down her man, and that led to steals," Roosevelt coach Bobby Keanini said. "Offensively, everybody feeds off her passes." Iwalani Rodrigues grabbed all eight of her rebounds in the first half, setting the tone with her transition plays. Kealoha and Tiyana Nakasone knocked heads when Kealoha ran a backdoor cut under the basket. The game was halted as both players regained their balance. By the second half, a welt had formed over Kealoha's eye and affected her vision. "I was dizzy," said Kealoha, who took only three shots and didn't score. Nakasone had a bag of ice on her cranium after the game. "After we bumped heads, we both were kind of out of it," she said. ROOSEVELT--Dianna Zane 13, Tiana Sugui 12, Iwalani Rodrigues 9, Kathleen Nakata 0, Jayna Tasaka 0, Shandree Armstead 2, Tiyana Nakasone 0, Brittni Au 0, Tasia Kamakawiwoole 7, Kaui Kuehu 0. FARRINGTON--Honour Stone 0, Sandy Valdez 0, C'ani Kealoha 0, Jorell Telefoni-Sablan 7, Macilee Moi 2, Elaine Leaupepe 4, Deja Bryce 8, Valerie Lesu 8, Polohiva Folaumahina 0. 3-point goals--Roosevelt 3 (Sugui 2, Zane), Farrington 1 (Bryce). Junior varsity--Farrington 31, Roosevelt 29. Sisters Jamie and Britni Ronolo combined for 39 points as Na Menehune defeated the Red Raiders. KAHUKU--Taeja Afalava 15, Brittney Fesolai 3, Krystle Manguba-Glover 2, LeNora Nauahi 13, Nicole Nautu 2, Keisha Moeai 0, Alayna Galeai 12, Tania Latu 0, Kenra Moe 3. MOANALUA--Hoku Dela Cruz 15, Michelle Hardy 2, Janelle Uncangco 7, Jamie Ronolo 21, Britni Ronolo 18, Dawn Dela Cruz 2, Tahirah Gibson 2. 3-point goals -- Kahuku 1 (Moe), Moanalua 2 (Uncangco, J. Ronolo). The Trojans outscored the Golden Hawks 11-4 in a decisive third quarter to pull out a close win. MILILANI--Jordan Sakai 4, Chelsea Basilio 10, Kimi Ebina 0, Glenelle Nitta 2, Jamielyn Kaleiwahea 4, Breana Locquiau 4, Haunani Richardson 0, Chantel Tanuvasa 2, Courtney Senas 0, Joleen Realin 11, Meilin Akiu 0, Laneisha Lewis 2. NANAKULI--Kamil Keawe 0, Sasha Montez 20, Sheila Argayoso 0, Ambree Hauhio 2, Britney Wolf 6, Lahela Sylva-Kanagusuku 0, Delisha Kaimi 8. 3-point goals -- Mililani 3 (Basilio 2, Kaleiwahea), Nanakuli 2 (Kaimi 2). Nohelani Fonoti scored 13 points to lead Na Alii over the Hurricanes. KAPOLEI-- Loleina Lapina 0, Danniel Tapat 5, Ashlee Dela Cruz 3, Tiffany Kasoga 1, Regina Simanu 14, Kesha Miller 0, Tamara Satcher 2, Jay Abbondanza 0, Cassidy Calio 1, Tahnee Foki 21, Hartley Marquez 0. AIEA--Tasha Johnson 4, Jennifer Yuen 2, Ashley Primacio 0, Natasha Helsham 12, Natasha Fong 8, Annie Orial , Michelle Shiroma 6, Sara Watanabe 1, Nohelani Fonoti 13, Tierra Tauanuu 2, Emily Tausaga 4, Carol Sio 2, Capri Holiona 11. 3-point goals -- Kapolei 5 (Foki 3, Tapat, Dela Cruz), Aiea 3 (Fonoti 3). 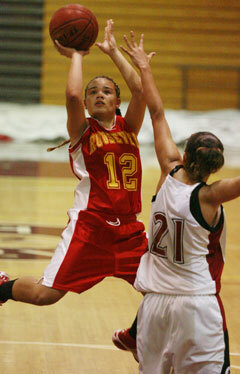 Candy Ames scored 11 points to lead the Knights past the host Surfriders. CASTLE--Kori Berinobis 3, Candy Ames 11, Niki Kobashigawa 10, Kelsea Berinobis 5, Sarah Phromisiri 7, Chevy Au-Stein 0, Leesha Domingo 2, Ette Ameperosa 6. KAILUA--Kristen Corrales 13, Tawny Kiko 2, Chelsea Babylon 0, Miki Scott 0, Tianna McKeague 0, Zsalei Kamaka 5, Pumehana Kanoa 0, Jarrish Mauhili-Kaneakua 0, Netia Ulugaono 0, Ashley Jacobs 9, Kahea Chang 5. 3-point goals -- Castle 4 (Kori Berinobis, Ames, Kobashigawa, Kelsea Berinobis), Kailua 6 (Corrales 3, Jacobs 3). Pearly Togiai scored 14 points as the Tigers routed the Cougars. KAISER--Sarah Aila 0, Jessica Dusich 10, Tiare Kepa 2, Kristyn Mathenson 10, Mari Mathenson 0, Chelsea Okuma 4, Leandra Poole 2, Jewels Ross 0, Kyla Wang 1, Kristi Yakuma 0. MCKINLEY-- Jackie Tihano 12, Kaitlyn Ikehara 3, Chelsie Sato 7, Jaelynn Lopez 3, Pearly Togiai 14, Joelle Sagapolu 0, Maribel Hebron 2, Kylie Sato 9, Sasha Hong 0, Allyson Villanueva 0, Jorina Faletoi 4, Crystal Tafai 4. 3-point goals -- Kaiser 0, McKinley 6 (Tihano 2, Sato 2, Ikehara, Lopez). The Raiders rebounded from a stagnant nine-point first half to score 20 points in each of the last two quarters against the Buffanblu. Dayna Jandoc scored 12 and Alana Matayoshi 11 to lead the way. IOLANI--Chelsea Unemori 0, Tami Konishi 4, Kylie Ahlo 4, Alana Matayoshi 11, Chanel Hirata 4, Dayna Jandoc 12, Jamie Smith 9, Raechele Takara 0, Sarah Turgeon 5. PUNAHOU--Ciana Aiwohi 2, Melanie Feldman 13, Ilima-Lei Macfarlane 0, Dara Tompkison 8, Erin Moon 0, Ashley Satterwhite 0, Janelle Nomura 7, Anna Merrifield 0, Chelsea Deptula 2, Devon Yamauchi 0, Taj'a Wong 0, Kysa Ludviksen 0, Tressa Torres 2, Tiera Jenson 0. 3-point goals--Iolani 2 (Jandoc, Turgeon), Punahou 0. High scorers--StA: Kelle Tom 17, Maile Tua 16, Minna Watanabe 12. Iol: Kaz Masutani 8. Kam: Jamie-Marie Ferrigno 12. UHS: Brittney Copp 7. HBA: Carisa Onuma 9. CA: Hanna Edwards 6, Michel Chon 6.